Our products are distributed as Shareware. This means you can freely download and try it . If you find it useful and wish to keep it over evaluation period, you should pay a registration fee(except freeware). What's the difference between Free and Professional Editions? 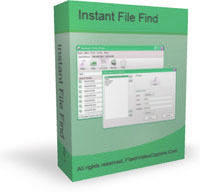 - Find files on computer instantly! "Instant File Find software is the best option for making a search as it would let you find the files with its highly effective intelligent searching technique. " "This file search app is absolutely the best I have used to date. Once it caches it finds folders and files so fast, even on USB drives that it is unbelievable. "